The mattress protector is supposed to be 100% waterproof on the surface. It is not an encasement mattress. 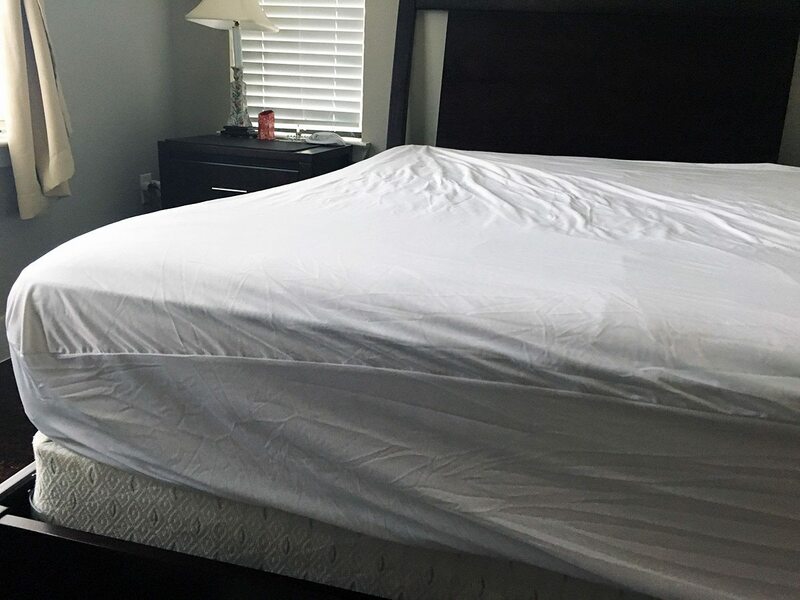 The material that covers the edges and narrow sides of the mattress is not the same as the top of the protector – only the surface of this protector is waterproof. Many of the negative reviews I read were from customers who experienced leaks in their protector. Often this was caused by accidents (or spills) from children. It happens! I decided to put the protector to the test. I poured 10 ozs of water in a concentrated area in the middle of my mattress. I thought this might mimic an accident or larger spill. 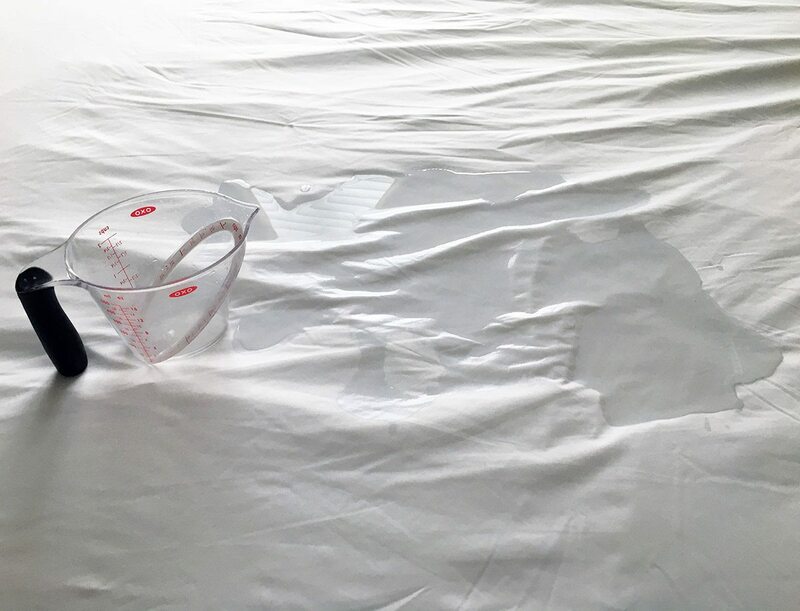 I let the mattress protector absorb the water for nearly two hours. I then ran my hand underneath the protector and felt no dampness, moisture or water. As I mention later in my review, care for this protector is important if you want your protector to stay waterproof. 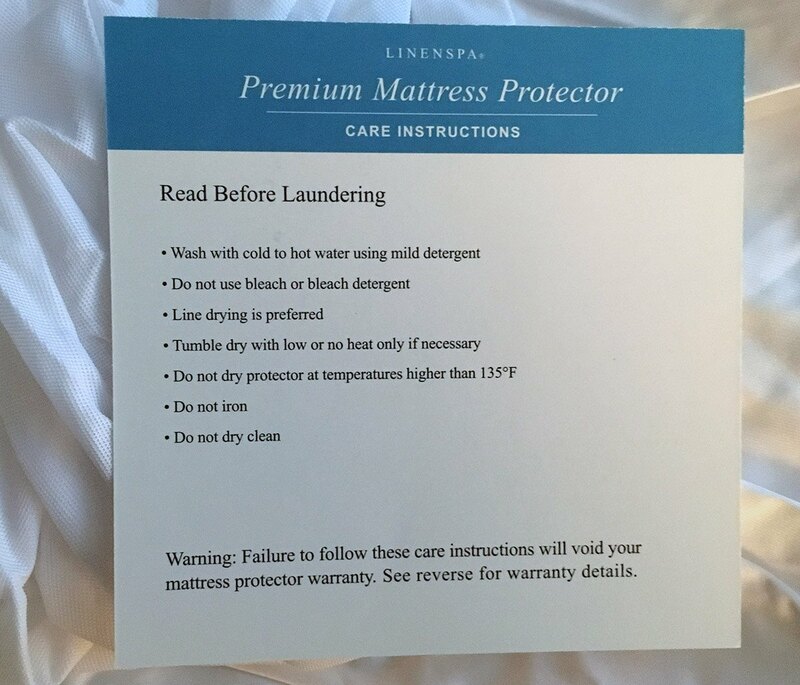 Per Linenspa’s instructions “heat settings above 125 degrees or over drying can impact the waterproof membrane.” They also recommend not drying the protector alone. Vinyl in Mattress Protectors: Unsafe for Children? In the past few years, there has been a lot of attention around the toxicity of plastics, including PVC (aka: polyvinyl chloride or vinyl). It is best to avoid using products made of PVC or Vinyl – especially if you have little ones. Linenspa’s mattress protector is vinyl-free. Instead, they make the protector waterproof by using polyurethane , which is considered relatively safe. Second, many mattress warranties will be void if you stain your mattress. One way to keep your mattress warranty intact is to use a mattress protector to stop stains or damage. Please follow the protector care instructions to preserve the integrity of the waterproof barrier and the product warranty. Machine wash in cold to hot water. Use a mild detergent without bleach or whiteners. Do not bleach. Tumble dry on low heat with other bedding. Do not dry the protector alone. Dry on low or no heat and remove from dryer promptly. Heat settings above 125 degrees or over drying can impact the waterproof membrane. Do not iron or dry clean. There are detailed written instructions provided in the packaging with the mattress protector. This affordable mattress protector is 100% waterproof, hypoallergenic and virtually noise free. I had a good experience with breathability although the overall fit was a little oversized. Would be an even better fit for thicker mattresses. Linenspa sells their mattress protector – on their own website and on Amazon – for $18.39. 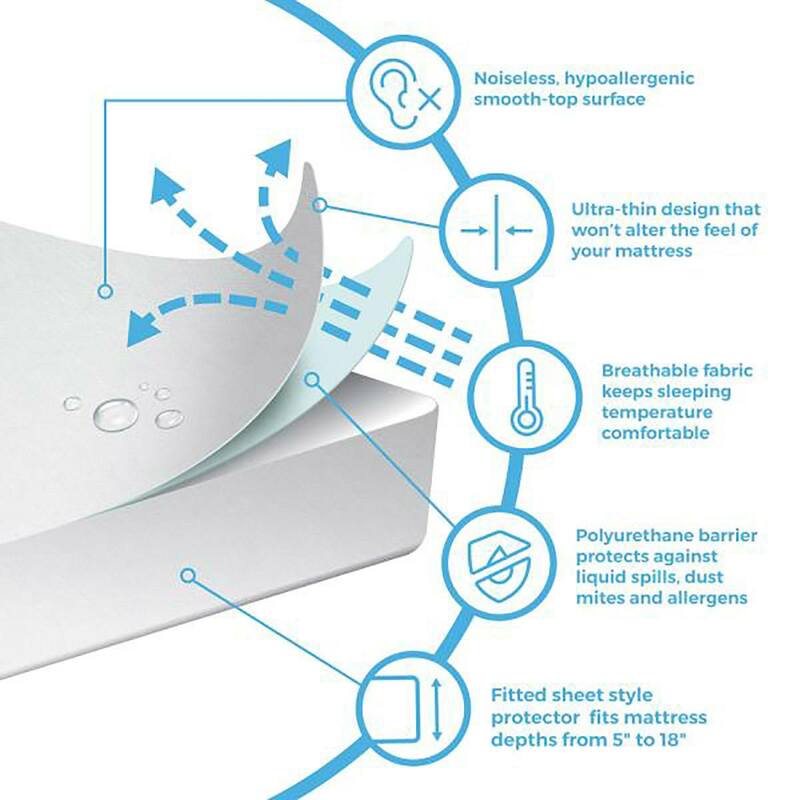 Please note that it is labeled as the “Smooth Mattress Protector” on the Linenspa website. According to both the Linenspa and Amazon, the protector regularly retails for $97.74. That is a huge discount and it makes me wonder if they really ever do sell it for full price. Is it always on sale so you feel like you’re getting a good deal? 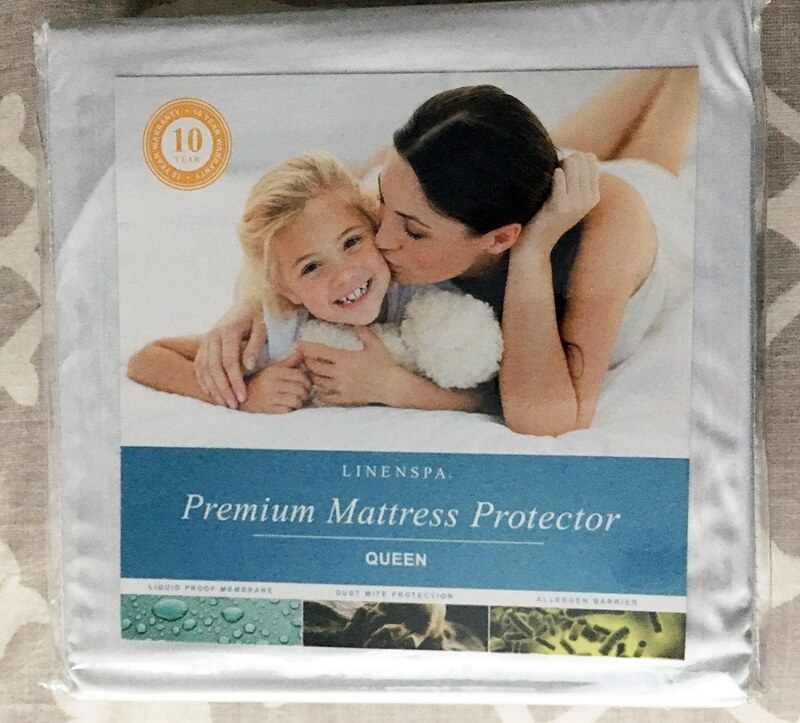 This is my review of the Premium Mattress Protector by Linenspa. 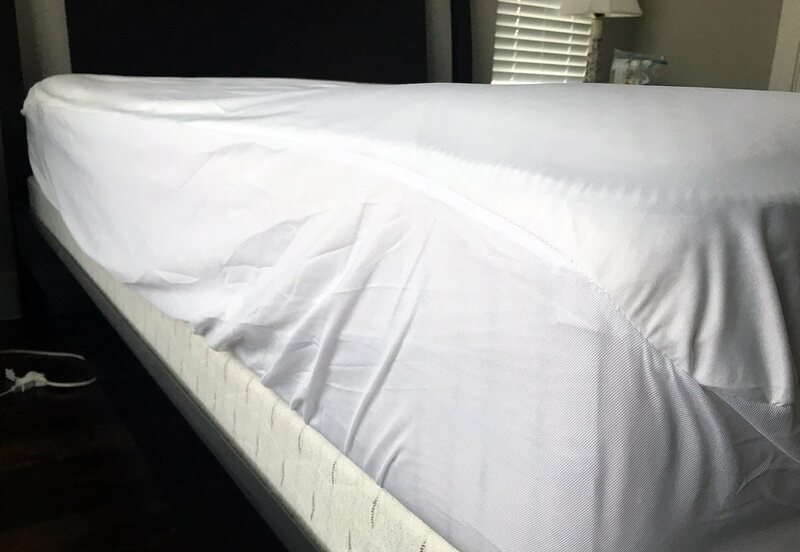 The mattress protector is simple and straightfoward. The surface is 100% waterproof and the whole thing is allergen-resistant and easy to wash (must not be dried alone). Comes with a 10 year limited warranty. A good deal if you can get it on sale for less than $20. Either way, I think it is actually a good deal for less than $20. It is lightweight, soft and has no weird chemical smells. It is fairly easy to care for (be sure to follow the instructions). It is not quilted or padded so it will not replace a mattress pad for additional comfort. While it is waterproof on the surface, this is not an encasement mattress protector (so set your expectations accordingly!). 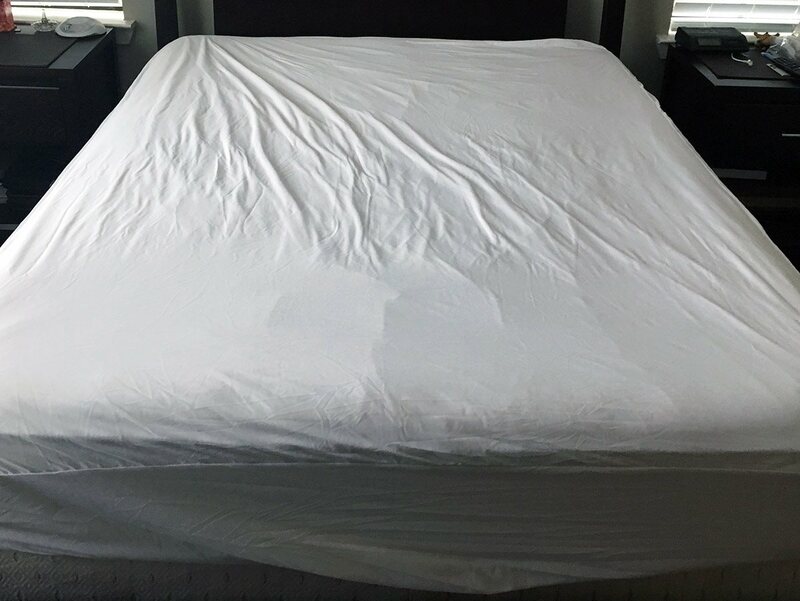 If you are interested in something with more padding on the surface- that can also help control temperature – read our review of the Slumber Cloud Dry Line Mattress Protector. Also, check out our best mattress protector picks.